In late 2014, staff from the Rare Books and Manuscripts Division found the Treaty of St. Mary’s intact, tightly rolled and placed into a box with miscellaneous documents. After spending some much needed time in the Martha E. Wright Preservation Lab, we are happy to announce it has a permanent home in appropriate archival housing. Patrons who wish to view the document can make a request through our “Ask-A-Librarian” service, here: http://www.in.gov/library/ask.htm. The Treaty of St. Mary’s was signed on October 6, 1818, in Saint Mary’s, Ohio, between the United States government, the Miami tribe and other territorial leaders. 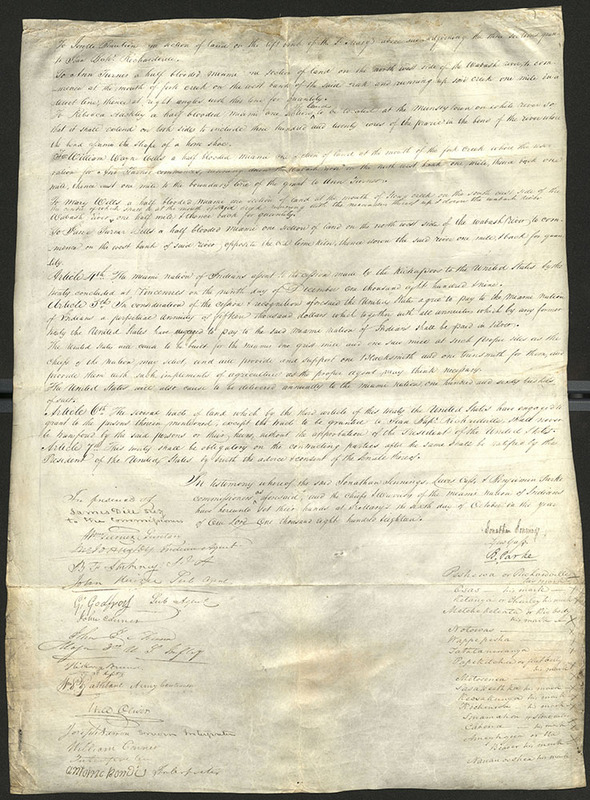 This treaty was drafted as part of a large-scale effort by the United States to purchase land from indigenous people, moving them to lands west of the Mississippi River. 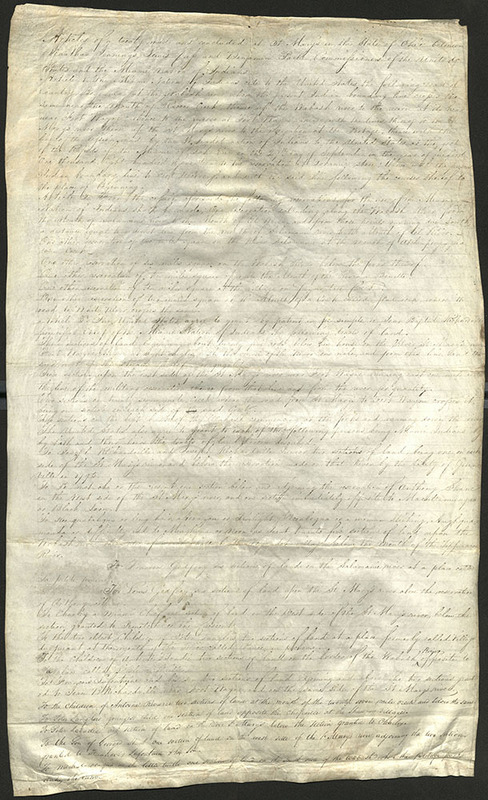 The Indiana State Library recently digitized the treaty, once belonging to Jean Baptiste Richardville (b. 1761-1841), Great Chief of the Miami Indian Tribe. 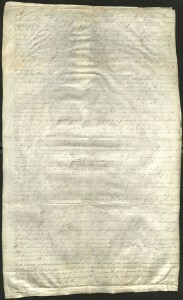 It is possible the document was retained by the United States government from Richardville to Francis La Fontaine (1810-1847), his successor as Chief of the Miami, from La Fontaine to Francis D. Lasselle (1807-1864), of Fort Wayne, Indiana, who married his widow, and from him to Charles B. Lasselle (1819-1908), of Logansport, Indiana, his executor. 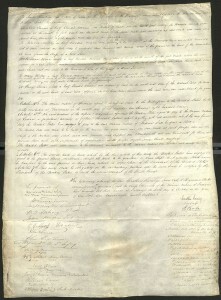 To view a complete transcription of the document, visit the Oklahoma State University Library’s “Indian Affairs: Laws and Treaties” digital project: http://digital.library.okstate.edu/kappler/Vol2/treaties/mia0171.htm. Interested in taking a road trip to the treaty site? The Indiana Historical Bureau (IHB) has provided a historical marker on US 421, south of the Wabash River bridge; north of South Road in Pittsburg, Carroll County, Indiana. For more information, visit the IHB “New Purchase Boundary” historical marker web page, here: http://www.in.gov/history/markers/54.htm. This blog post was written by Bethany Fiechter, Rare Books and Manuscripts Supervisor, Indiana State Library. For more information, contact the Indiana State Library at 317-232-3675 or “Ask-A-Librarian” at http://www.in.gov/library/ask.htm. This entry was posted in Rare Books & Manuscripts and tagged History, Indiana, Indiana State Library, Rare Books & Manuscripts, Treaty of St Mary's by indianastatelibrary. Bookmark the permalink.